"ATM Remote Key Management Solution"
To be best in class, an effective ATM remote management system has to clear various significant hurdles. While there are many ATM remote management solutions, very less offer the completeness, robust applications, ease of use, ATM-centric expertise and affordability of CO-OP ATM Visual Control. ATMs have always remained a significant piece of a credit union’s functionality, and play an essential role in offering convenience to members. 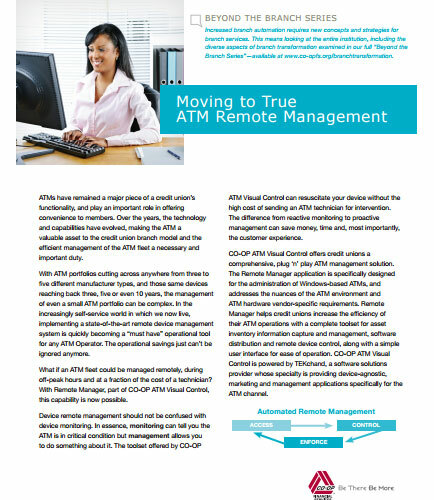 This whitepaper highlights the importance of moving to true ATM Remote Management, ATM as a valuable asset to the credit union branch model and also explains the efficient management of the ATM fleet as a necessary duty.